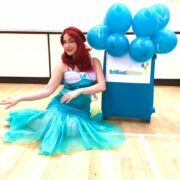 A firm favourite with the girls, Ariel is a beautiful underwater princess who only comes out on very special occasions. This underwater extravaganza will set all children’s imaginations on fire and make sure that your children’s Mermaid party is the talk of the playground! 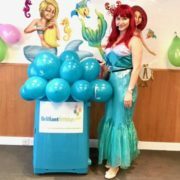 Your children’s party entertainer will provide under the sea delights such as a bubble machine, dolphin glitter tattoos and much, much more! 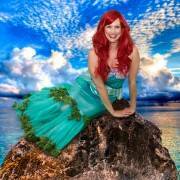 The magical mermaid party provides 1,2 or 3 hours of under-the-sea fun for your birthday child and all their friends. Your magical mermaid party includes crazy games, dancing with scarves, maracas and pompoms, prizes galore and of course, lots of bubble fun! 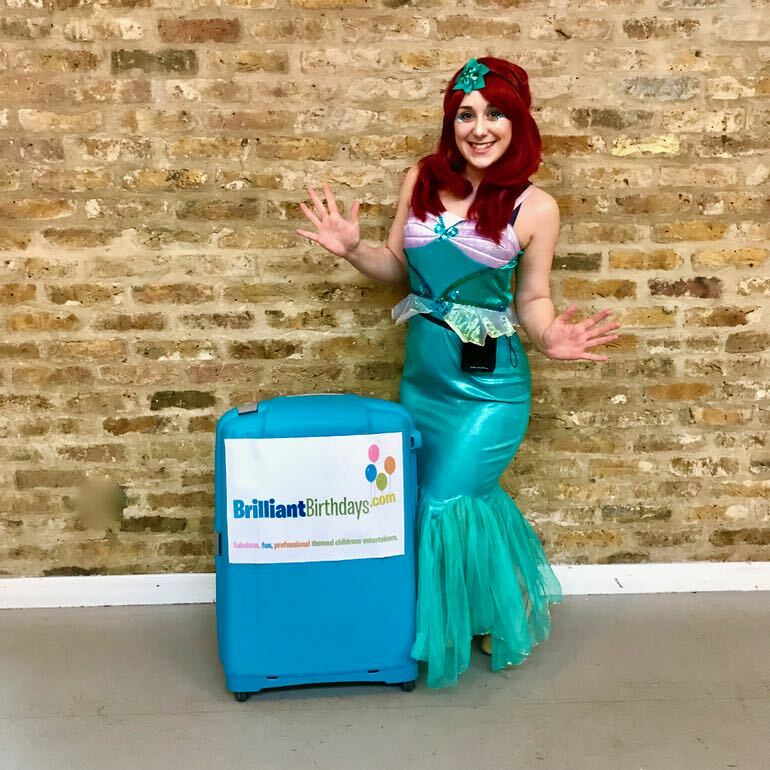 Your magical mermaid party gives you a stress free solution, leaving you to relax while your magical mermaid children’s party entertainer ensures your little mermaid has the best birthday ever! 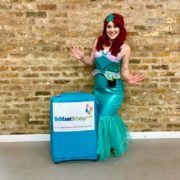 With the very best children’s party entertainers in London, your magical mermaid party will go swimmingly, providing high energy fishy fun for a maximum of 30 little mermaids and mermen. Travel is free for magical mermaid parties within the M25, with a 40p per mile charge from and to the M25 for magical mermaid parties further out to sea! Your magical mermaid party will enchant and delight your birthday child, giving them a magical mermaid birthday party they will remember forever. Once again we were really impressed with Brilliant Birthdays and Clara did an amazing job as Ariel. Everyone commented on what’s great party it was and were saying that entertainer was fantastic so please pass on our thanks to her. The best moment had to be when Poppy arrived and met Ariel. I will not forget how happy and a little overwhelmed she was! Anyway thanks again, we will definitely be using BB in the future and recommend you to friends. I want to say a big thank to Laura for making my daughter’s birthday splending, everyone had fun , the kids where very excited to see her , they all fell in love with her. Thank you so much to Sophie who did a brilliant job at Brooke’s Mermaid party 🙂 She kept the 6 and 7 year olds entertained throughout. The party was geared towards this age group and they all enjoyed themselves. There was limbo dancing, dancing with cheer pom poms.Bubble games. Pass the parcel with nice little gifts for everyone. All the girls had a lot of fun I would definitely recommend this company and Sophie to entertain at your party. Thanks for Magical Mermaid !! She is a very truly magical. Would book you again and would always recommend you. Oh and the children had so much fun! 🙂 Many Thanks! We had Magical Mermaid party for our 6 year old girl. It was a lovely party. All the children had a great time. They were so entertained and all the parents loved it and asked for your business card. Thank you! 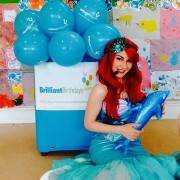 Beautiful Mermaid Entertainer who had the girls and boys under her thumb from the moment she entered the room! Wonderful to see a true professional at work! Thank You Brilliant Birthdays for such a great entertainer and for making the booking process fast and easy! Huuuuuuuuge thank you to Sarah who did my daughters 3rd Birthday party on Saturday! She provided, music, bubbles, balloons and much, much more! 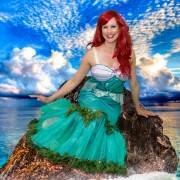 She really made our Magical Mermaid party very special ! 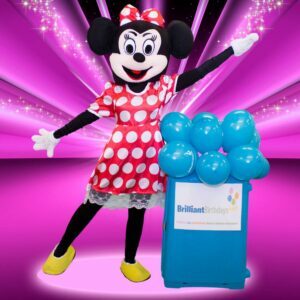 I’d definitely recommend Brilliant Birthdays to anyone looking for entertainers that go the extra mile!! Thank you! Thank you Brilliant Birthday for Magical Mermaid Party last weekend ! 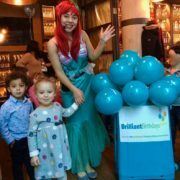 Our Mermaid was lovely and amazing with children! Everyone had so much fun! Magical Mermaid Party was magical indeed! 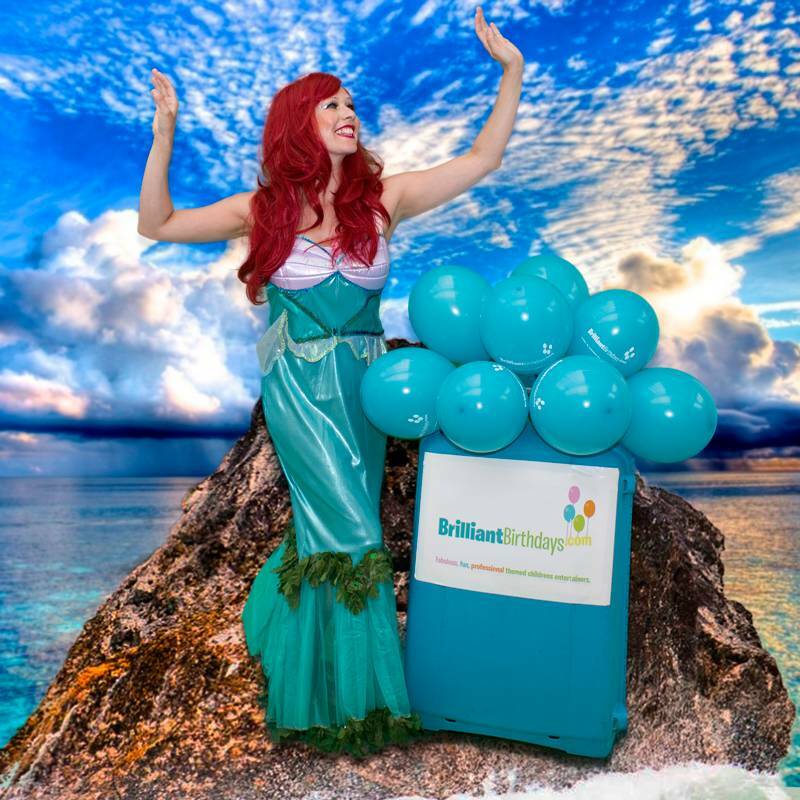 Thank you Brilliant Birthdays for sending the mermaid ! She made my daughter feel very special! I will definitely contact you in the near future again! 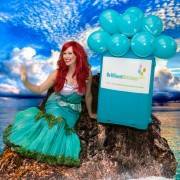 A beautiful Mermaid and party from Brilliant Birthdays Thank You so much my daughter had a ball! 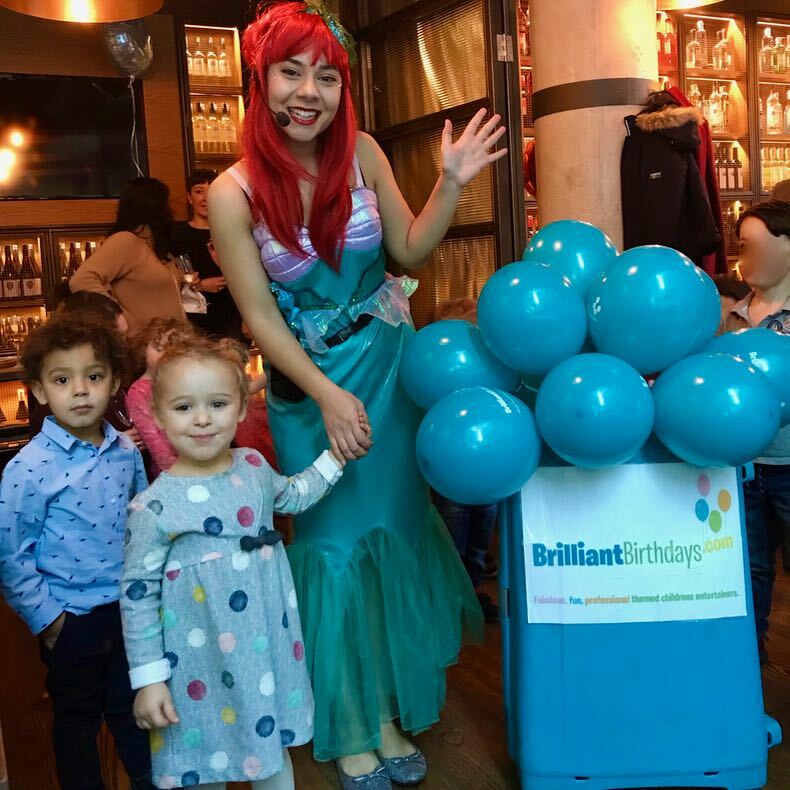 I would love thanks again BB for providing absolutely brilliant service and Introducing us with Christina wonderful mermaid who made party for our little 4 year old unforgettable!!! Our daughter was so happy still keep talking about the party. I have used BB for 4 times and I will definitely use them again as they have never let me down. Highly professional and very friendly service. We and the children were all very happy! Thank you so much… Keep Brilliant !!! Heidi, our Mermaid for the party, was absolutely brilliant. She called me to discuss the arrangements a couple of days before; she arrived early for the party; and she entertained the children brilliantly. They loved her approach and party games. Heidi was also sympathetic to our requests in terms of keeping the noise not too loud (the party was outside in our garden) and she managed the timing well. Highly recommended! I will always come back to the best children’s entertainers in London! 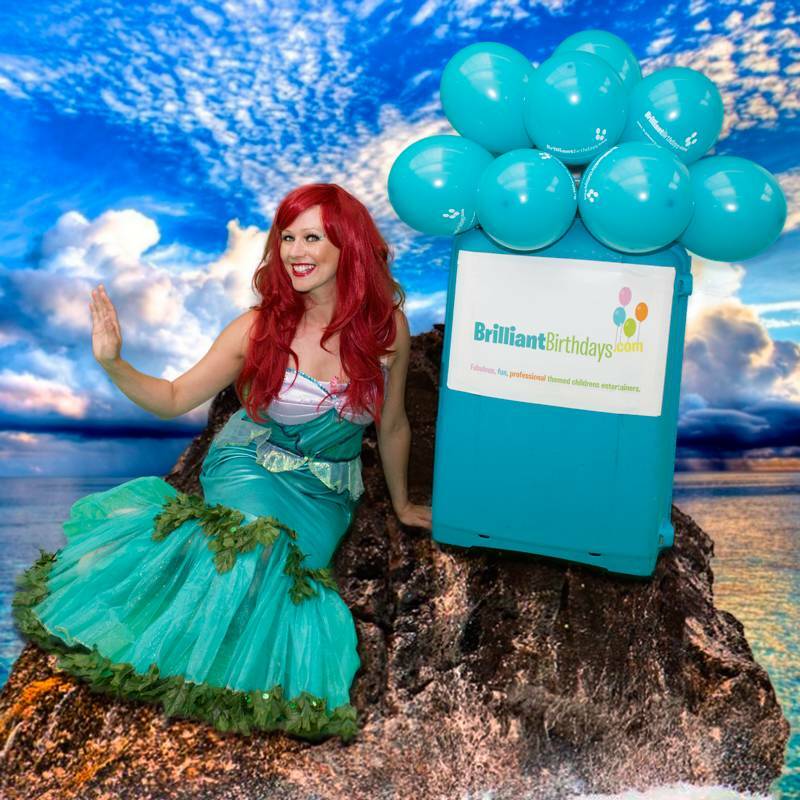 Thank you Brilliant Birthdays for sending over Magical Mermaid! She was Superb! I attended my nieces Brilliant Birthday party and she had a wonderful time. She really loved the Magical Mermaid dancing, games and prizes. The entertainer was able to engage with children of all ages. I would definitely recommend Brilliant Birthdays to family and friends for any future party’s and family events. Thank you for a lovely party with mermaid from Brilliant Birthdays, she was magical indeed.. all kids loved her and she had very professional and fun approach! Many thanks! I really can’t rate Brilliant Birthdays enough! 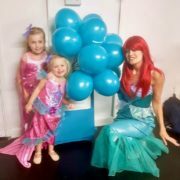 We had Magical Mermaid party theme for my daughter’s 4th birthday party and she was awesome .. and went above and beyond! She had lots of supplies, games and energy… overall 2hrs of brilliant entertainment, the kids adored her, what more could I have asked for ?! Thank you! The entertainer Christina was amazing and entertained my daughter and her friends for 2 hours. 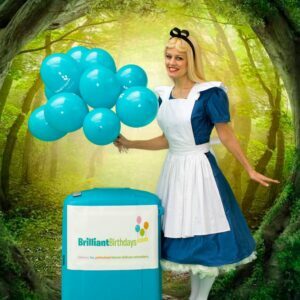 Would definitely recommend Brilliant Birthdays service to anyone considering a party!! 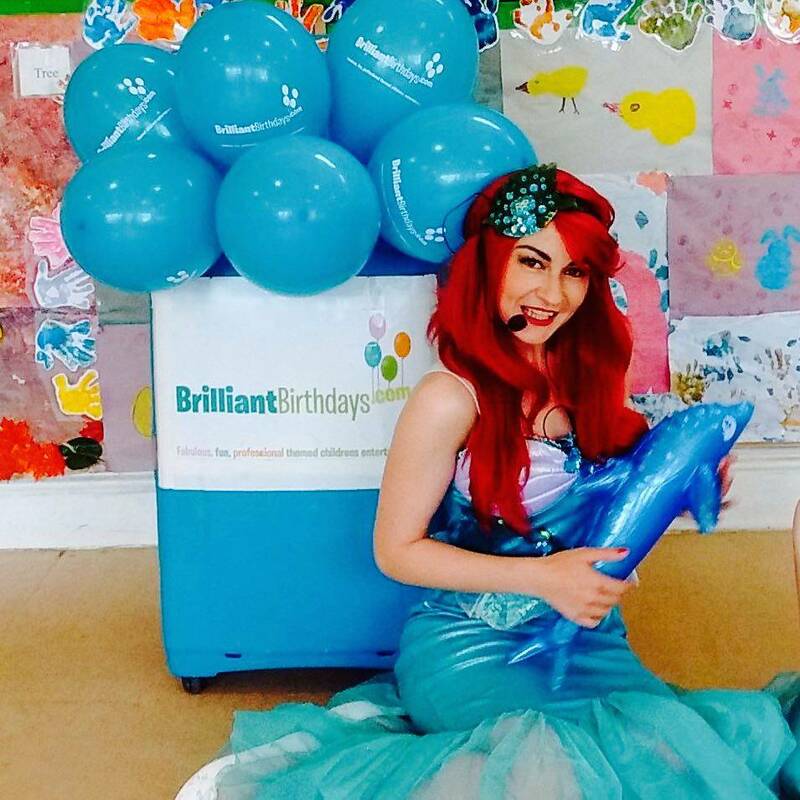 Thanks Brilliant Birthdays for a Magical Party with Magical Mermaid! Christina, our entertainer, was phenomenal. It was the birthday party of our 3 years old daughter and all children were around 3, with the exception of a 5 years old. 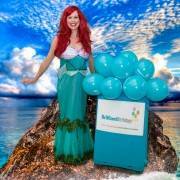 All children just loved Christina the Mermaid. The children’s attention was caught from beginning to the end and had a great time. The adults could actually either chat and have a glass of wine (or participate to Christina’s games and songs in some cases…). The overall results was that both children and parents were very happy with the party.